From The American Spectator. July 30, 2013. This spring brought us two movies, both set in 1947 and both intended to remind us of a time when it was easy for people to think that the world had begun again as a better, happier and more hopeful place — as a venerable New World and millenarian tradition periodically expects it to do. In an obvious but still inspiring way, 42 showed us how, perhaps with a confidence born of our having licked the Nazis and the Japs, we turned inward after the war to lick the evil of racism among ourselves. Jackie Robinson’s breaking the color-line in baseball was a small but important early victory — more like the Doolittle raid on Tokyo than the Battle of Midway — but it still portended much more impressive and morally creditable things to come. Joachim Ronning’s and Espen Sandberg’s new version of Kon-Tiki, by contrast, looks sadly more like an end than a beginning. My favorite moment of that film comes after its opening passages, during which we have watched Thor Heyerdahl (Pal Sverre Hagen) attempt to raise enough money to fit out the expedition by which he hopes to prove his theory that Polynesia was first settled not from Asia, as was generally believed, but from South America. As the film shows it, Heyerdahl is not having much success until he goes to Peru for a meeting with the Peruvian president, whom he tells that he is trying to show it was Peruvians who first settled the South Seas. Then we cut to a shot of a massive American aircraft carrier as the narrator tells us how the Peruvian president called the American admiral and the American admiral called Heyerdahl and told him to come take what he needed from the ship’s fantastically well-stocked stores. As we see him there, along with his rag-tag band of Scandanavian adventurers, suddenly we catch a glimpse, at least as poignant as that on show in 42, of what the world was really like in 1947. Europe and Japan still lay in ruins, and America bestrode the narrow world like a colossus. When practically everybody else was either starving or just scraping by, we were typically careless in our abundance — careless and charmingly generous, especially with those, like Heyerdahl, who brought a spirit of daring and adventure to their devotion to science. We also, though we would come to doubt it when Sputnik went up a decade later, led the world in science — as we led the world in supposing that science was bound to improve the lot of mankind. Like 42, Kon-Tiki, though it is mostly about Norwegians, recaptures the sense of hopefulness and promise in America of the immediate post-war years. True, it is harder in the latter case to see how, or if, that promise was fulfilled. The movie allows the audience to assume that Heyerdahl’s theory was proved by his success in reaching Polynesia on a balsa-wood raft, though in fact it is still highly controversial. I think the film was right to have concentrated on what was admirable about him, even if that means manufacturing some conflict and drama, which seems to have been notably absent from the voyage itself. 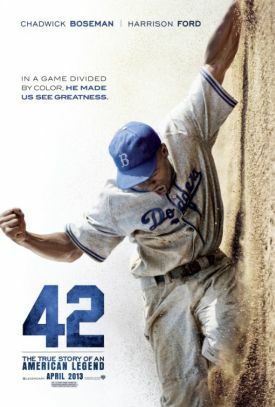 In the same way, 42 makes the moral drama of Jackie Robinson’s rookie season starker — the expression "black-and-white" may come to mind — and more all-consuming than it was. Movies are not the same thing as history, and it would be foolish to expect them to confine themselves to unembellished historical facts kept firmly in place in an unaltered historical context. Yet the film-maker ought to have in common with the historian a respect for the past as past, a recognition that his purpose is to reveal to us anew, as if we were living it ourselves, the world as our parents, grandparents or great-grandparents would have known it. The alternative is to foster the illusion, already too powerful and tempting in most of us, that the old-timers were just as we are, barring trivial material differences, and thus to leave us unable to recognize either them or ourselves for what we are. That, alas, is the illusion on which Baz Luhrmann’s new film of The Great Gatsby is based. Set in another period of America’s confident expansiveness a quarter of a century earlier than 42 and Kon-Tiki, this Gatsby turns out to be a repudiation of the past — and not just the particular past of 1922 but of pastness itself. Scott Fitzgerald’s Gatsby, having already been turned into a style icon by the Clayton-Coppola-Redford version of nearly 40 years ago, has now been taken out of its time altogether and transported to our own. You can tell by the sound of Jay-Z "rapping" on the sound-track. Nor is his rap irrelevant to this tale of love and money in the Jazz Age. It is a way of making the Jazz Age irrelevant — in effect, non-existent because indistinguishable from the Rap Age — as it claims poor old Gatsby (Leonardo DiCaprio), rich, corrupt and self-obsessed, for the bling-fancying hip hop culture of our own day. It is as if Jackie Robinson had been portrayed as a Black Panther. Does it matter that, by seeing the 1920s through the lens of our own times, we deliberately shut our eyes to all that made the people of that period different from ourselves? I think it does. Though Mr Luhrmann’s movie is made visually in 3-D, it is artistically and intellectually made in 1-D, and for an audience which has never been told that there are important moral as well as material differences between themselves and those who preceded them on this earth — or that, even if there were such differences, there could be anything interesting about them, or anything we can learn from them. This is a particularly galling thing to have been done to Fitzgerald’s novel, the last word of which is "past," but it is hardly surprising. Like Jay Gatsby, Baz Luhrmann legally changed his name while still a teenager, and the fact suggests the affinity between these two self-invented, temporally disconnected men. Mr Luhrmann also has something in common with Fitzgerald, at least if we believe his own account, for his film has been, he says, like the novel before it, "horrendously criticized." Therefore, presumably, we may expect that the movie will enjoy the same sort of exalted reputation as the book eighty-odd years from now. He apparently doesn’t consider the possibility that in three-quarters of a century the novel’s reputation will be reduced to something like that of the movie. I’m not predicting it, mind you, but it does seem at least possible that the illusion on which both the novel and its cinematic translation are based will not survive the tough times that currently seem to lie ahead for America’s position of leadership in the world. For Gatsby — perhaps more in its interpretation than in the novel itself, though this includes an interpretation endorsed by Fitzgerald, one of whose proposed titles for his novel was "Under the Red White and Blue" — has come to be seen as an expression of the "American Exceptionalism" of the left. For some reason, those who are most vehement in denying the special virtue of their fellow-countrymen are also the most willing to see in them an unusual degree, if not of evil then at least of self-deception. To such politically-motivated people it is as if Americans invented material ambition, greed and ostentation and, having invented them, were subsequently locked into a nationality and a culture defined by such things. Conventional lefty moralists may condemn that culture and look forward to sweeping it away while "Baz" and his rapper friends may celebrate it, but what they have in common is a firm conviction of their own superiority to the commonalty, their own exemption from the beastly bad taste in which it is sunk and which their own intelligence or insight allows them either to deplore or, like Mr Luhrman, ironically to celebrate. Either way the important thing is to generalize the sense of disillusion given to the narrator, Nick Carraway (played by Tobey Maguire in the movie), making it not just a reaction to the Vanity of Human Wishes but to a vague sense of the failure of what, a few years after Gatsby was written, was to become known as "the American Dream." Even before the term gained currency, that is, Fitzgerald was looking forward, as I have written elsewhere, to its routine use by the left to stand not for a shining hope held out to the wretched of the earth but an absence of such hope, a bitter ironic commentary on the fact that, remarkably enough, "utopia" remains, as in Greek, "no place." We have now become so used to this negative and ultimately absurd version of the hopefulness of America and Americans that Mr Luhrmann can take it for granted as something to give a gloss of moral and political seriousness to his dreary fantasy of the 1920s. It’s only what we expect from Hollywood these days, but it makes all the more valuable any remaining glimpses we are afforded of America as it once was and so might be again.